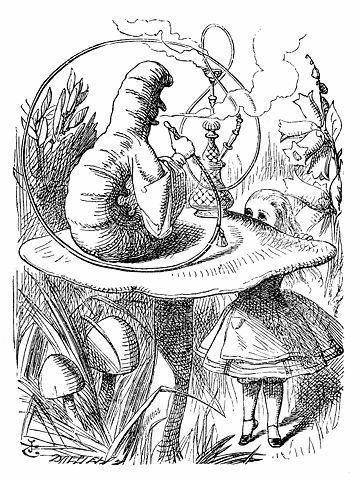 'I - I'm a little girl,' said Alice, rather doubtfully, as she remembered the number of changes she had gone through that day. It was so long since she had been anything near the right size, that it felt quite strange at first; but she got used to it in a few minutes, and began talking to herself, as usual. 'Come, there's half my plan done now! How puzzling all these changes are! I'm never sure what I'm going to be, from one minute to another! However, I've got back to my right size: the next thing is, to get into that beautiful garden - how is that to be done, I wonder?' As she said this, she came suddenly upon an open place, with a little house in it about four feet high. 'Whoever lives there,' thought Alice, 'it'll never do to come upon them this size: why, I should frighten them out of their wits!' So she began nibbling at the righthand bit again, and did not venture to go near the house till she had brought herself down to nine inches high.